Haven't tried Glade® Expressions™ Fragrance Mist yet? Try it for free with the mail-in rebate. 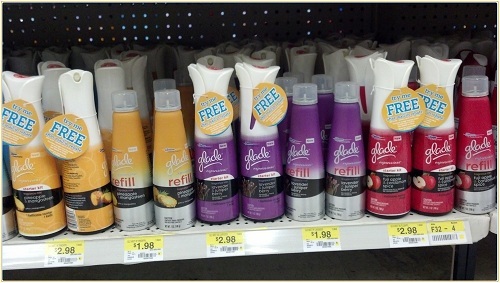 Purchase any Glade® Expressions™ Fragrance Mist Starter between 4/1/12 and 12/31/12, you can get up to $4.99 back by mail. Send the original cash-register receipt with the purchase price of the product circled, the original rebate hangtag, the product UPC and this completed form. Glad Expressions Fragrance Mist is on sale for $2.98 at Walmart, there is a $1 off Glad Expressions Fragrance Mist starter kit coupon available to print. You can earn $1 profit when you use this coupon and submit the rebate. If you are interest in this product, you can purchase the refill for $.98 with the $1 off Glad Expressions Fragrance Mist refill coupon.